As much as Beatrice Hyde-Clare relished the challenge of figuring out who murdered a fellow guest during a house party in the Lake District, she certainly does not consider herself an amateur investigator. So when a London dandy falls dead at her feet in the entryway of a London Daily Gazette, she feels no compulsion to investigate. It was a newspaper office, after all, and reporters are already on the case as are the authorities. She has her own problems to deal with anyway - such as extricating herself from a seemingly harmless little fib that has somehow grown in into a ridiculously large fiction. And so Bea is off to the British Museum because she cannot rest until she confirms her suspicion, while trying to allay her family’s concerns and comprehend the Duke of Kesgrave’s compulsion. For the handsome lord has no reason to waste his time solving a mystery alongside a shy spinster. And yet he turns up everywhere she goes. Another winner from Lynn Messina. I enjoyed getting better acquainted with Beatrice and am looking forward to the next installment. So many clever twists and turns! How refreshing to read(listen to) such a well written and well read book. Very highly recommended as the reader is perfection exemplified. 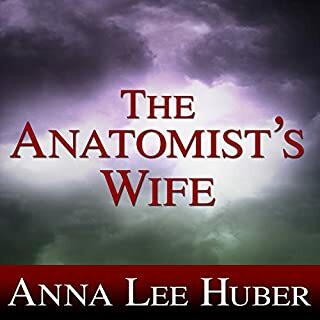 My wife and I are looking forward to the follow-up books being part of the audible selections! Please hurry!! I received this book for free. I am voluntarily posting this review and all opinions expressed herein are my own. What a wonderful follow-up to A Brazen Curiosity. It is a standalone book [no cliffhanger ending]. However, I highly recommend that you start with the first book in the series. The author is kind enough to provide summaries of events which occurred in the first book [or if it's been a while, to refresh your memory]. Here, Beatrice, fresh from solving the mystery in Book 1, is back home with her aunt and uncle. She has also told a bit of fib to her family- regarding her interest in a man she has completely made up. Unfortunately, they are becoming more insistent on meeting him. So, what's a girl to do? Kill off her paramour. Bea writes a death notice and travels to the newspaper to post it. While there, a man stumbles in with a knife in his body and dies at Bea's feet. Now what? She quickly escapes back home but the man's death looms in her mind and she is sure she has seen that knife before. She decides to look into it and as she does - her investigation brings her back into the company of the Duke of Kesgrave. The witty banter between Bea and the Duke as their affection/admiration for one another grows is so engaging and fun. I love how Bea, who started in the first book as timid as a church mouse, has started to grow into a confident woman. Bea's aunt - who is so concerned about societal decorum at all times - is a complete hoot. I am completely hooked on this series and recommend it highly. The narrator is a completely perfect complement to this series! Jill Smith’s narration lifts this regency cozy from charming to absolutely delightful. Adorable characters, a slowly budding romance and a tinge of mystery make this an addictive series. I do hope there are plans to produce audible versions of the next two books. I am hooked on this series. Love the witty banter and energy. They remind me of a non-paranormal version of the “soulless” series. Please record more! A Scandalous Deception is the perfect blend of family drama, romance and whodunit style mystery. The heroine of the story, Beatrice, is a 26 year-old lady during the Victorian era, and she not only lives at the generosity of her aunt and uncle after the death of her parents, she is a confirmed spinster past her prime. Although Beatrice knows her position in society and her family better than anyone, and she plays her role as a demur young lady when necessary, inside her beats the heart of a wildcat. This is the second book in the series, and I loved watching her develop from the first book into an even more adventurous and courageous woman. She is joined in her investigations by the most eligible bachelor in all of England, Duke of Kesgrave, and these two make the perfect team. He is the first person to acknowledge and appreciate Bea for her ingenuity and willingness to break the social restraints of the women of her era and standing in society. The mystery had me stumped until Bea and The Duke unmask the guilty party, but it was even more the evolving friendship between them that made this story so enjoyable for me. 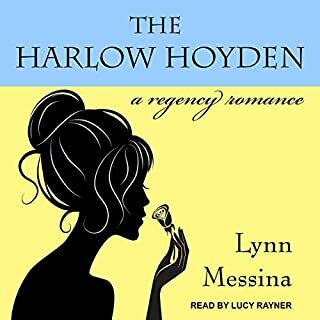 Add in some truly hilarious scenes in which Bea is caught in her antics by her uptight aunt and uncle, and A Scandalous Deception is an all-around excellent choice of an audiobook credit. Jill Smith narrates both books in the series, and she is an excellent choice with her beautiful English accent. Smith handles both the male and female roles with equal skill, and her delivery adds just the right tone to emphasize Beatrice's dry wit and The Duke's occasional supercilious humor. I am looking forward to many future books in this series, and they will hopefully all be read by Smith. I absolutely loved listening to this book. The narration was beautifully done and made the story if possible even more entertaining. 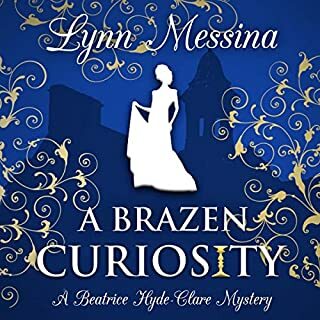 Lynn Messina does a phenomenal job with all of the characters and leaving enough possibilities to the solution that it keeps you guessing and fully engrossed. She adds in quirky, amusing characters, and situations that gives the comic relief throughout the mystery/drama. Overall, it's just an extremely well written and performed book and I can't wait for more. I was given this free review copy audiobook at my request and have voluntarily left this review. On another note I tend to be a bit harder on the books I get to review, but this one was just that good. When a man drops dead at her feet in the newspaper office (where she’d gone to place a death notice for her fictional ex), Beatrice feels that it is none of her business and she slips away before anyone can identify her. It will be investigated by the authorities after all. She needn’t even think about it. Except... that knife that was sticking out of that dandy’s back... Hadn’t she seen it at the British Museum? So off she goes, to see if the knife has been stolen. And there she meets the Duke of Kesgrave who came looking for her, because he knows that she was somehow involved. And thus follows a series of actions and events that lead to the solution of whodunnit. There’s also a bit of ruminating by Beatrice about her feelings for Kesgrave. Although the the premise and plot are good, I found myself disappointed. The characters are interesting and well developed, but the pace is slow. This is due to the amount of time Beatrice spends on internal monologues. The narration by Jill Smith is fair. She does a good job of giving voice to the characters, and differentiates well between the genders. Despite that, her voice comes across as thin. I felt like she needed to add a bit of “oomph” to give a stronger performance. Although I enjoyed most of the book, I found that I skipped minutes of listening time as referring to past events became retelling the story completely. The actual story is only about half the book as the author goes into prose of thoughts and returning to previous experiences time after time. While it may take an author months to write a book, we are reading or listening for mere hours. We get it, remember and don't need to have many recaps of the story. As I've already bought the next book I'll listen to it and have my finger on the forward button. Having very much enjoyed the first book in the series, A Brazen Curiosity, I was delighted to listen to Bea's return in this new adventure. It was a joy to have Bea and Kesgrave solving another mystery together, needling one another along the way. Narrator Jill Smith struggled a little with some of the trickier aspects of an upper-class British accent in the first book and was caught out by the pronunciation of Regency terms and phrases, but it is clear that she has worked hard to address them this time. Her performance appeared much less forced, and this natural delivery in turn helped Bea's character feel more authentic and allowed for a far easier connection between the listener and the lady. Although there were still a few mispronunciations (such as 'Grecian', 'chaise longue', and 'passages'), Smith seemed much more confident, and in this book the narration stood out for its charm, not its faults. I was impressed by the improvement from the previous audiobook, and actually enjoyed the narration this time. I still believe that the Duke of Kesgrave's voice made him sound a little older than his years but it remained consistent with our introduction to the character in book one, as did all the other voices. As I settled into A Scandalous Deception, I did feel that rather too much time was spent summarising the previous book. 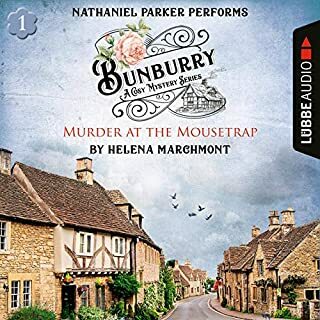 The first fifteen minutes of this audiobook were almost exclusively devoted to recapping prior events, but some explanation was necessary to make this a stand-alone novel and it is difficult to supply the listener with that information without indulging in a little exposition. As in A Brazen Curiosity, Beatrice once more reminded me of Alexia Tarrabotti in Gail Carriger's Parasol Protectorate series (which is now available from Audible UK once more, after disappearing for a while). There's no higher compliment I can pay an intelligent, forthright female in a historical novel than to compare her to one of my favourites, and whilst it did feel as if some of the misunderstandings between Bea and Kesgrave became a little too contrived, I do very much enjoy their interactions and verbal sparring, much as I loved Alexia's early jousts with Conall in Soulless. I was very glad to hear Kesgrave's wry humour return in full force in this book, and laughed aloud at more than one of his sardonic comments. The similarities to Georgette Heyer's The Corinthian were undeniable this time, not only because of Bea's masculine disguise but due to the Duke - somewhat affectionately - calling her "Brat". As The Corinthian is one of my favourite Heyer's, I was not disappointed to note that little nod to it. In fact, I was not disappointed by any of it, really, and as with the first book - and every other that I enjoy - I found myself stretching out my listening once I realised I was halfway through and that my time with Bea and the Duke would soon end. A Scandalous Deception built on a cast of engaging characters and drew me even further into their lives. I hope the wait for the next book is not terribly long, as I am already looking forward to finding out what they get up to next. 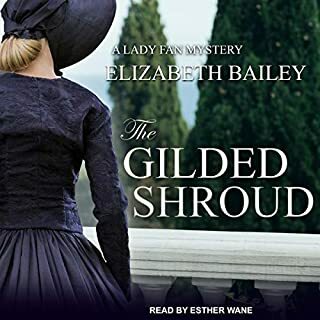 I'd gladly recommend this book to listeners who enjoyed, A Brazen Curiosity and anyone who likes cozy mysteries and Regency romance. Whilst the will-they-won't-they romance is somewhat secondary to the mystery, the book does not shy from the Regency era's societal preoccupation with making a good match, and is a nice way to explore that world from a slightly different perspective. A moment of evil intent. The start of a new Season, and 26 years old Beatrice Hyde-Clare has endured six of them already, all without securing an eligible husband. So she no longer has any illusions that this year she will sparkle with witty conversation and dazzle with stunning good looks. Just the contrary, in fact. And although looking forward to seeing again the Duke of Kesgrave, with whom she had previously developed a surprisingly pleasant aquaintanceship, this time the London elite will surround him and she doubts he will even remember her name. So begins this delightful tale of murder, mystery and manners in Regency society and the reuniting of Bea and Kesgrave in pursuit of the truth. With echoes of Jane Austen, the socially mismatched couple follow clues, make sweeping deductions and further their friendship to Bea's growing confusion. A nice, gentle who-dun-it? within the turbulence of Regency manners and amusing dialogue. As narrator, Jill Smith's Crystal clear presentation adds sparkle to the text as she also gives different voice to the numerous characters. The whole is a delight. 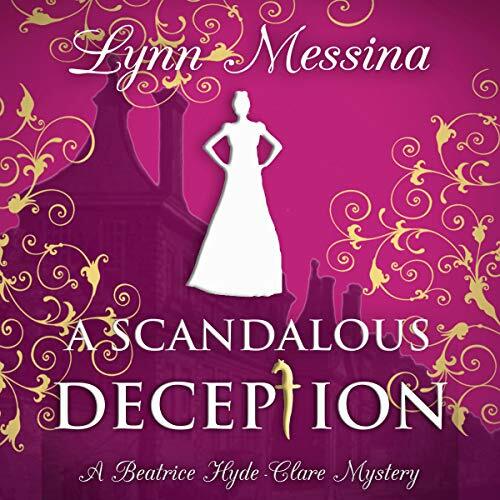 My thanks to the rights holder of A Scandalous Deception, second book in this series by author Lynn Messina. At my request via Audiobook Boom, I was very fortunate in being freely gifted a complimentary copy. Thank you. 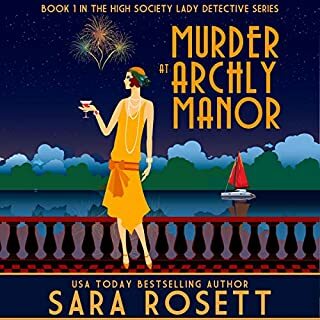 My not having read book one in no way diminished my enjoyment of this one and I can recommend it to anyone who enjoys light historical murder mysteries with the hint of romance in the air. A brilliant follow up to A Brazen Curiosity. I listened to this book in one day and I am itching for the next book in the series. I thought it hilarious that Bea would go to a newspaper office to put in a death notice for her fictitious former love. Not only that but a murder victim falls dead at her feet at the same time! The whole scene was thoroughly entertaining and had me gripped. I love the friendship that Bea and the Duke have. There is a hint of possible romance as the author teases us with 'will they or won't they' and I am adoring every minute of it. Excellently narrated and a fantastic read. I am a firm fan of the series! I voluntarily reviewed an advance review audio copy.